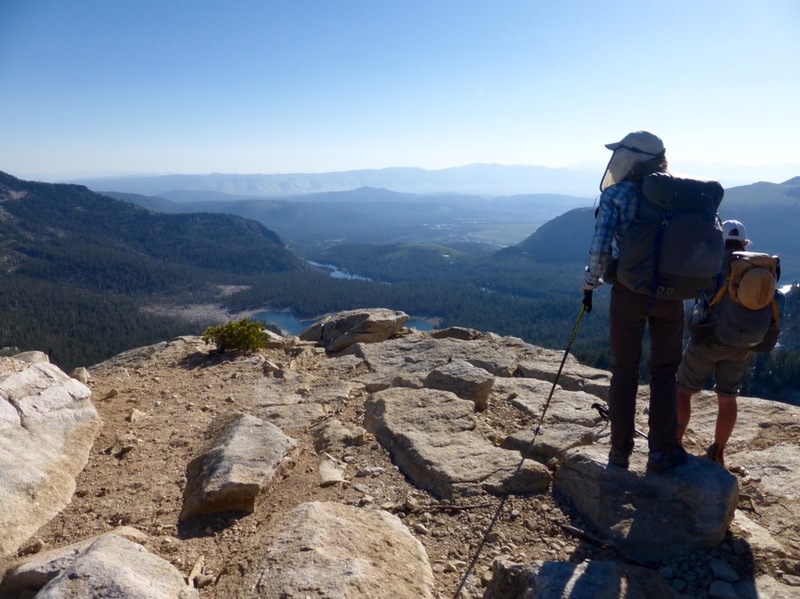 We had 9mi mostly on trail to Reds Meadow, where we take a shuttle to Mammoth this morning. It was town day! The goal was to make it to Reds for breakfast, but of course we found a way to make things interesting. 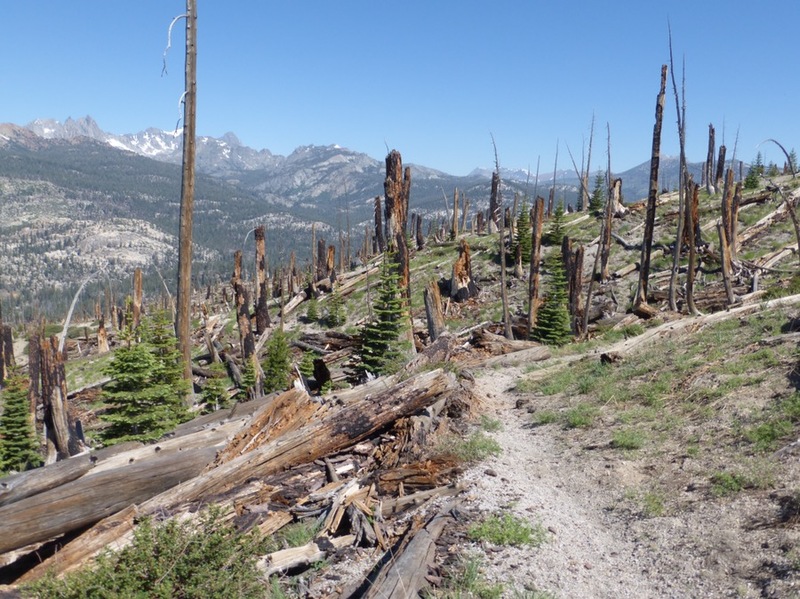 We had a nice trail leaving Deer Lakes that took us back up on the Sierra Crest. From there we could look ahead to where our last week will be. We could see the Mountains of Banner and Ritter, which we will be near, and which Rockin’ and her family summited the week before our hike started. Early morning hiking on the Sierra Crest with Banner and Ritter in the distance. 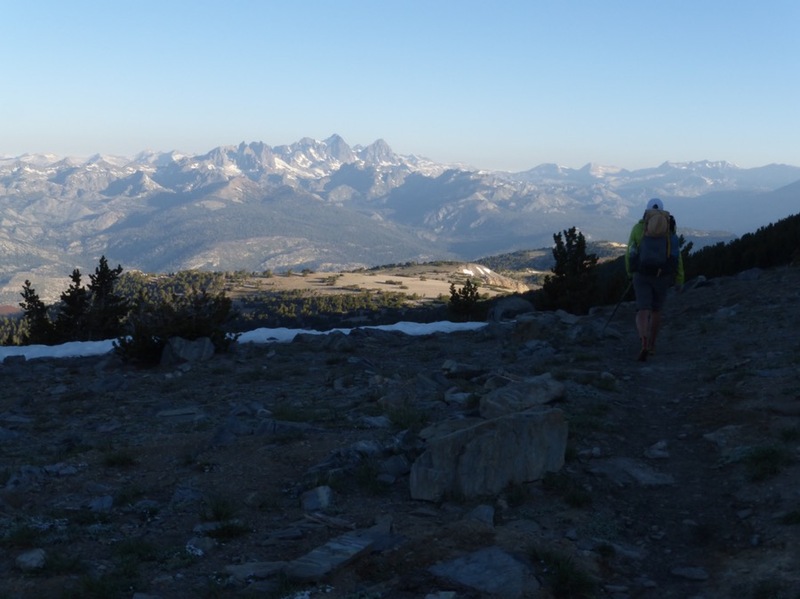 Our one off-trail task for the day was to do a steep descent to Mammoth Pass off the Sierra Crest. It involved deep sand, pumice, and rocks. At first, I wasn’t a fan, but the deeper sand made it more fun than frightening once we got past the sketchy steep slick stuff. 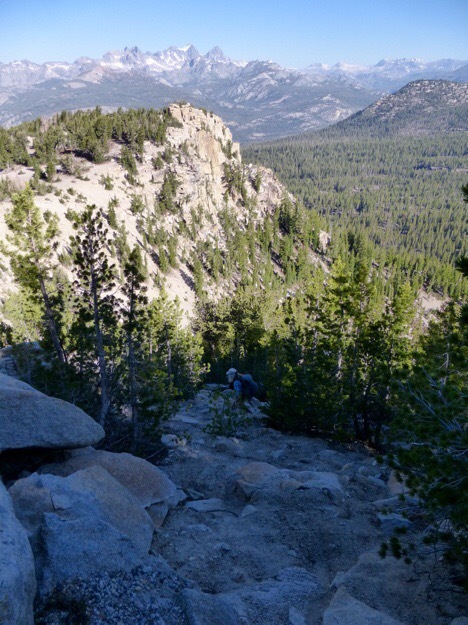 Looking down on Mammoth Lakes. Steep descent to Mammoth Pass. 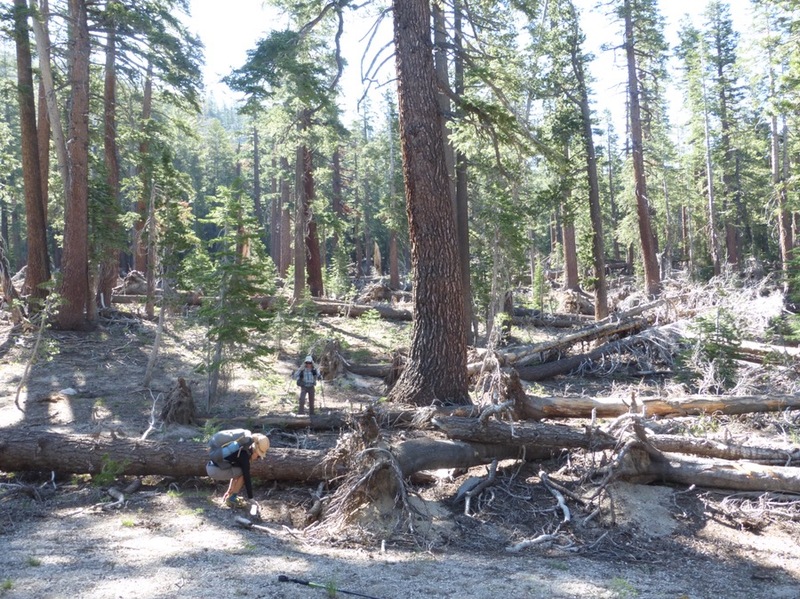 Once we got down, we were in the demolished forest that I now associate with Reds Meadow. In 2012, there was a strong wind storm that made this section around Reds look like the apocalypse. 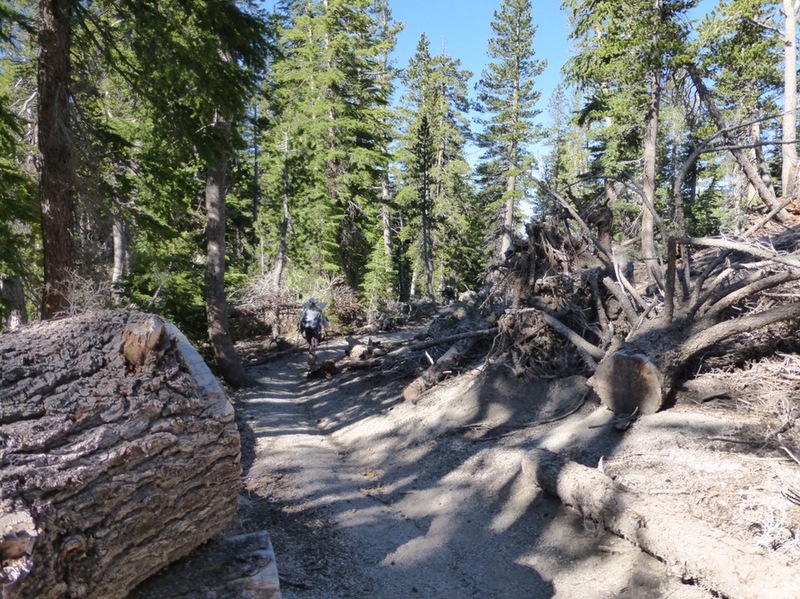 We intersected the trail and Rockin’ led the charge on the downhill cruise to Reds Meadow. After 10mins, we hit an intersection that didn’t make sense. We looked at the maps…we had taken the wrong trail down! We have been really good about not checking the GPS and there are a lot of intersecting trails in this area. I had an instinct to check it when we did hit trail and kicked myself for not checking. We had gone .5mi in the wrong direction and rather than go back, we realized we could save time (in theory) by going cross country through the apocalypse to where we needed to be. It was classic that we would do something like this as we are most anxious to save time and get to food. We made it through the blowdowns fairly quickly with just one acrobatic stumble from Rockin’ over a tree that looked like a front flip. We all had a good sense of humor about the fact that this happened in the one area we were supposed to cruise on trail. Making it through the apocalypse. 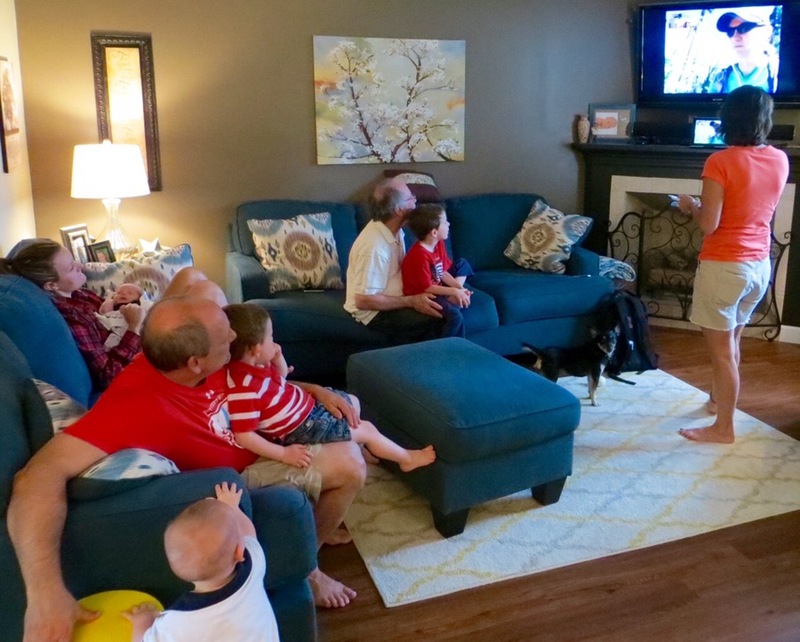 Once we got back on trail, I was able to FaceTime with my family, which a lot of them were together for the 4th of July in Southern Illinois. They were able to put me up on the tv to talk to everyone as we cruised down. I liked being able to show them the trail and also show them the mountains we were headed toward. With the family for the 4th! Perfect! Photo from my family of our FaceTime together. The burn area near Reds Meadow. Wait, we aren’t done yet. 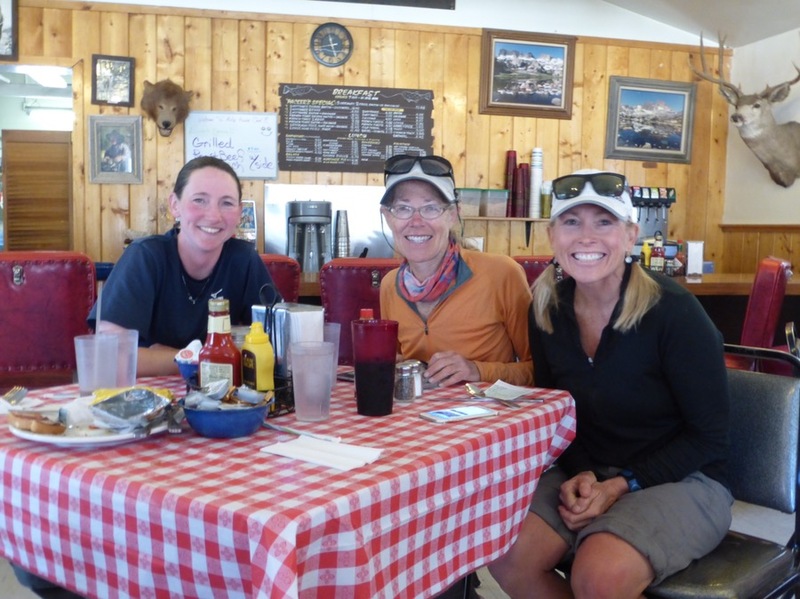 We took yet another wrong fork in the trail down to Reds and found ourselves on another cross country adventure to finally get to Reds just before they stopped serving breakfast. We haven’t been so ragged all route with all the dirt and scrapes we got this morning. Reds Meadow with many of the PCTers we saw yesterday. Eating at the diner at Reds Meadow. 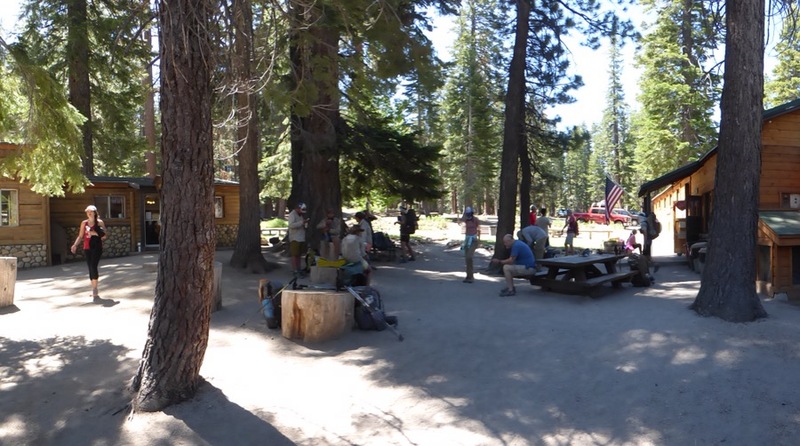 We took the shuttle into Mammoth Lakes, and it was packed for the 4th. Not my favorite thing and it got me stressed to be around so much commotion, so I did my best to efficiently grab food and supplies from the grocery store that would last through our zero tomorrow so I wouldn’t have to leave the condo tomorrow. 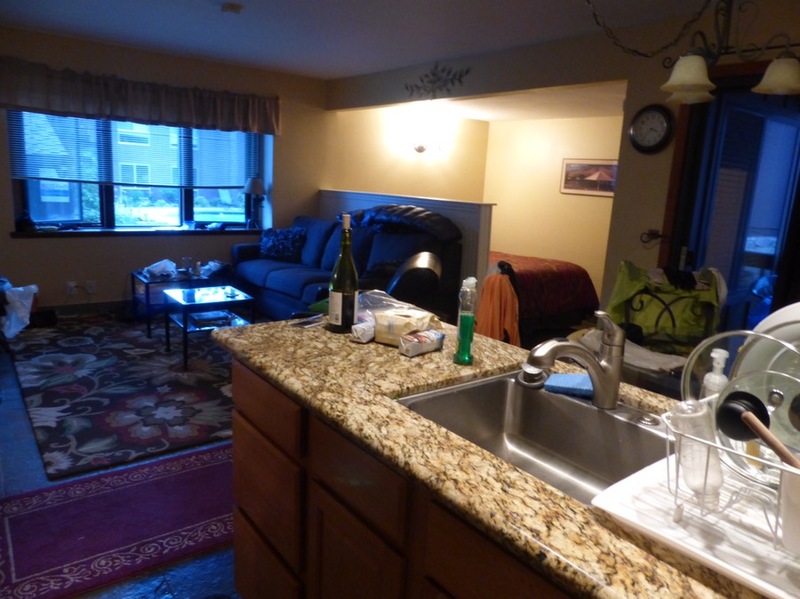 We made the decision to rent a more spacious condo with a kitchen for a bit more and it is so worth it! Tomorrow will hopefully be a relaxing zero, but my and Why Not’s resupply boxes didn’t arrive. We are hoping they are at the Post Office, but we won’t know until tomorrow. That will be a headache if the packages aren’t there…. I remember many of the passes and lakes quite well from when a friend and I fast packed the JMT in 87. Beautiful country. Remember the soft volcanic ash and sand going into Reds Meadows. Have a great trip and I will relive it through your posts. Our gear and food were quite different back then. Man, that must have been a cool time to do that before all the gadgets and social media. We thought we were light at about 32 pounds. No apps, no GPS – I think we took the guide book. I can still visualize much of the trail and the passes. Congrats on all the bushwacking getting into Red’s Meadows. 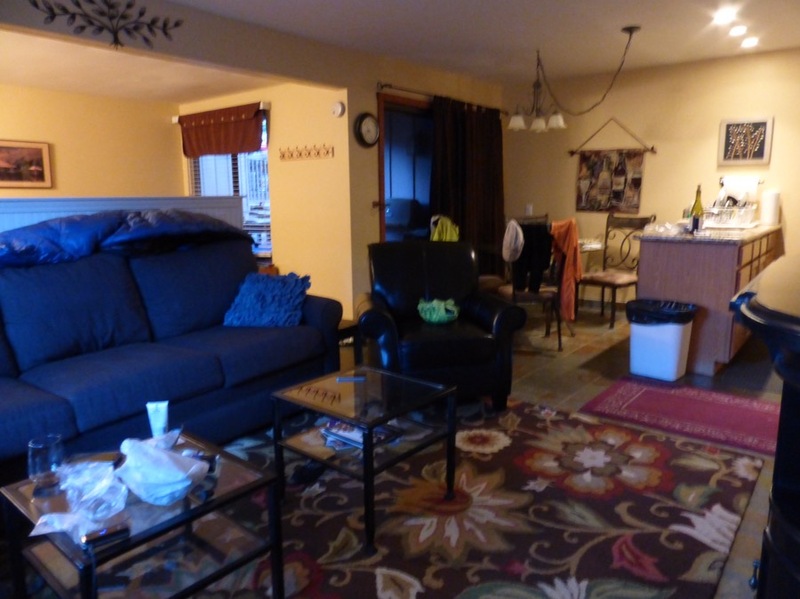 Looks like a nice condo to get a little down time and rested up for your next leg. My family spent summer vacations at Red’s Meadow Resort. So many great memories of fishing and hiking in that valley. I was in Mammoth Lakes in early June and the road down into the valley wasn’t open yet, and I had to come back to the Portland area without being able to visit, so your pictures fill a little void I had in my trip. Thanks! That’s great to hear Dan. A funny coincidence is that while that road was still closed, Rockin’ did a hike up Banner and Ritter that required going in that way in mid June. The road was closed, so they just hiked in on the road something like 8mi. They said they were the first ones to sign the peak registers since the fall and seemed to be the first ones out this year. Pretty cool!